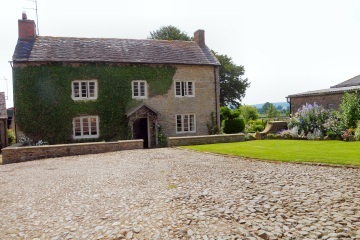 A truly wonderful base from which to explore Shropshire and the surrounding counties, Court Farm is a listed farmhouse set on a 330 acre working mixed farm in the peaceful and idyllic hamlet of Gretton. In the Norris family for a number of generations, the house has been sympathetically renovated to provide two beautifully appointed bedrooms offering guests four-star rated accommodation engulfed by tranquillity. While providing high quality furnishings, a number of personal touches ensure a homely and relaxed atmosphere. A double room and a twin room are available each with their own en suite facilities and unspoilt views over the farmhouse's traditional country garden. A delicious full English breakfast is offered each morning in the elegant dining room to start the day off in the best possible fashion. Guests also have access to a private sitting room where a fire will be lit during the colder months. A staircase leads from the hall to the bedrooms positioned away from the owner's quarters for added privacy and peacefulness. The rolling hills and countryside around the farm are ideal for walking, exploring and relaxing. Plan walks on local footpaths that start from the farm or amble along leafy lanes. 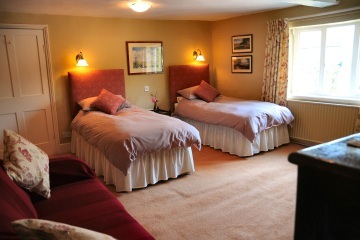 Each room has plenty of information on suggested local attractions and places of interest to visit. The C17th Royal Oak pub in Cardington, one of Shropshire's most beautiful villages, is within easy walking distance (883 metres). 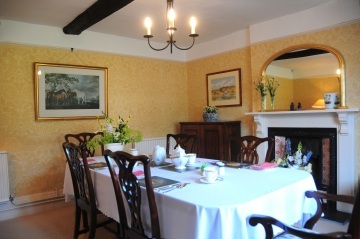 Court Farm is perfectly located to explore Ironbridge Gorge & Museums (birthplace of the Industrial Revolution), the market towns of Shrewsbury, Bridgnorth and Much Wenlock and the wealth of eateries in and around Ludlow. There is also an abundance of National Trust properties, beautiful gardens and English Heritage sites to choose from. For further details please contact Alison Norris at Court Farm, Gretton, Church Stretton, Shropshire SY6 7HU with all enquiries and reservations welcome on 01694 771219.